Sixteen years ago, I walked into a major department store to register for my upcoming wedding. I was excited about it at first — who doesn’t love gifts? — but five minutes in, I just wanted to go home and climb under the covers. I was completely overwhelmed by all things I was being told I would “need” as a newlywed, particularly all of the kitchen gadgets and tools. As salespeople bombarded me with pizza stones, ice cream makers, and bread machines, all I could think about was the fact that my typical dinner at the time consisted of wrapping deli meat around a pretzel stick and a pickle spear, dipping the whole concoction in dijon mustard, and washing it down with a beer. If you’re a newlywed yourself, or just starting out on in the kitchen, it’s really hard to navigate the many cooking tools, gizmos and gadgets that are out there. All it takes is one step inside any kitchen store, and you’ll suddenly be convinced that you need a special slicer for every fruit and vegetable known to man, a heart-shaped egg mold, and an arsenal of utensils so huge, you’d have to build an addition onto your house to store them all. But many of those items that look cute or seem useful in the store will end up getting lost in a drawer and never touched again. I’ve been cooking regularly for many years now, and I do NOT have a ton of tools and gadgets in my kitchen. Each year, I find I actually get rid of more kitchen tools than I bring in, and I’ve pared my kitchen items down to the essentials that I use on a regular basis. I’ve spent the last few days going through my cabinets and drawers, and compiling a list of my favorite kitchen necessities. These aren’t the only things you’ll find in my kitchen, but these are the things I feel like I can’t do without. If one of these items were to break or disappear, I would definitely need to replace it ASAP! I’m hoping that this list will help out anyone who wants to making cooking a priority, but isn’t sure where to begin. This is a great list to share with engaged couples, newlyweds, somebody moving into his/her first home or apartment, or anyone who wants to start to cooking at home with more regularity. Hopefully it will help to take some of the guesswork out of stocking your kitchen, and show you that less is more when it comes to kitchen gadgetry. Note: The links below are affiliate links, which means I may receive a small commission for any purchases made through those links, at no additional cost to you. I bought this exact Cuisinart stainless steel cookware set about 10 years ago after spending tons of time researching online. I can honestly say that I use each and every one of these pans on a regular basis, and they cover all of the bases, whether I’m making soup, pasta, steamed veggies, stir-frys, sautes, patties, or sauces. If you’re used to cooking with nonstick pans, the stainless steel ones can take a little getting used to, but they are much more durable, and my set looks brand new despite the excessive use. I don’t love using nonstick pans because they seem to wear out very quickly, but I keep one on hand solely to use for cooking eggs or other foods that might stick too easily to stainless steel. I’ve tried some of the “green” ones, but have yet to find one I love, so in the meantime I’m sticking (ha!) to my Cuisinart nonstick skillet. Some people swear by using cast iron skillets for almost all of their cooking needs. I prefer to use my stainless steel pots and pans for most things, but I do rely on my Lodge Logic cast iron skillet for searing meat, or cooking dishes that require high heat. If you’re a regular reader of my blog, you probably already know about my deep love for Crock Pots. I now own two because one just wasn’t enough for me, but they are both the original Crock Pot brand. My first crockpot is over 15 years old and still going strong! I know that Vitamix has taken over the blender world in recent years, but I’ve had this regular, inexpensive Oster blender for over a decade, and it has never let me down! I’ve used it to make smoothies, popsicles, soups, sauces, and plenty of other things, and it works great. I wouldn’t describe this device is as a need, but it is something I really enjoy using, and use often. The Griddler is sort of like a slightly adultier version of the George Foreman grill I loved so much in my Hollywood apartment days. I use the grill plates for making paninis, or grilling hamburgers, chicken or other meats indoors when it’s not outdoor grilling weather; and I use the griddle plates when I want to make a big batch of pancakes. It has a great non-stick texture that mimics a nonstick pan, but it opens up to create a much wider surface than a saute pan offers. A Kitchen-Aid standing mixer would be fantastic for someone who does tons of baking, but this simple hand mixer has served all of my baking needs for 15 years. It works great for whipping eggs, making mashed potatoes, mixing frostings, or creating any sort of batter. Like the Griddler, a food processor isn’t a necessity if you’re just starting out in the kitchen, but I do use my Cuisinart 8-Cup Food Processor quite regularly. My favorite thing to use it for is making homemade pestos in the spring and summer, but it also comes in handy for making sauces, salsa, tapenade, or for finely chopping garlic, meats, or vegetables. I can’t stress enough how important a good quality knife is if you want to take cooking even a little bit seriously. The day I got this Global 8″ chef’s knife for my birthday was the day my whole approach to cooking changed. I swear, as soon as I lifted it from its box I just FELT like a better cook. If you do buy a chef’s knife, I highly recommend taking a class on how to use it, not only for safety purposes, but to learn techniques that will drastically speed up and improve your chopping abilities, and make slicing and dicing feel like something enjoyable instead of a chore. I took a knife skills class from Sur la Table , and it was the second best investment (besides the knife itself) that I made in my cooking journey. If you don’t have a Sur la Table near you, check out local cooking schools to see if they have knife skills classes available. A good serrated bread knife will last you forever, and is totally necessary for cutting bagels, homemade bread, or crusty bakery bread (which you know I love almost as much as my crockpot). The one I have is an artisan style that was a wedding gift, but any high quality serrated knife will do. A solid wood or bamboo cutting board is key, especially if you’re going to be using a sharp knife on a regular basis. I’m a huge fan of my John Boos Maple Cutting Board , but if you’re looking for a less expensive option to start out with, I also really like these Epicurean Cutting Boards . I have one large one, and one small one, and I use them ALL the time. I use my microplane grater for zesting lemons and limes, shredding fresh ginger, and most frequently, grating fresh parmesan cheese over hot pasta, soups, and salads. The rubber handle makes it easy to hold, and I love the super-fine way that it grates. When you add cheese to a dish, it’s like a sprinkling of snow, and it just melts right into whatever you’re adding it to. Other tools I use regularly are: a scraper (ideal for transferring chopped veggies to a pan or pot), spatula, tongs, wooden spoons, vegetable peeler, cheese slicer, manual can opener, slotted spoon, colander/strainer, potato masher, meat tenderizer, a whisk, measuring cups & spoons, and a rolling pin. You can take all of the guesswork out of cooking meat with a simple digital meat thermometer. Use it when grilling, roasting, or sauteeing any type of meat; it especially comes in handy when you’re cooking something large, like a whole chicken, turkey or a roast. Thermometers come in all varieties with timers, alerts, etc. but I prefer to just keep things simple with a “poke and go” style. I know they make separate lime, lemon, and orange juicers, and even electric ones, but unless you’re planning on making large batches of freshly squeezed lemonade or OJ on a regular basis, just one manual citrus juicer is all you need! It allows you to get as much juice as possible out of your citrus when making dressings, marinades, or sauces, and you don’t have to worry about getting seeds in whatever you’re making. I have two of these mini colanders, and I use them almost every day to quickly rinse and serve fresh berries, grapes, and raw vegetables. The lid goes on the bottom after you’re done rinsing so you don’t drip water everywhere. And, as a bonus, they are collapsible, so they hardly take up any room in your cabinets or drawers. I could suggest a few more things, but this post is long enough as it is! 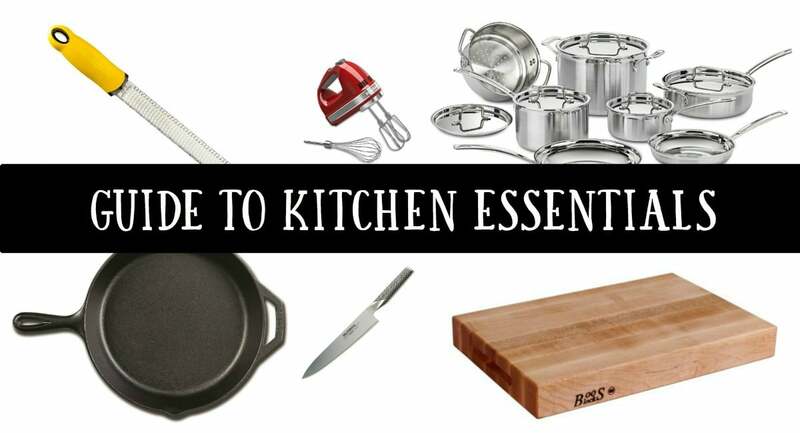 Like I said, this list does not encompass every single kitchen item I have in my home, but there are the things I use all the time and feel confident recommending to everyone. You really don’t need a bunch of elaborate tools to make good food regularly at home. If you have any specific questions about any kitchen products or any of my recommendations, feel free to ask me in the comments. I love this list Alyssa! It’s so easy to get caught up in all of the crazy gadgets out there to use in the kitchen. I actually have that exact same cuisinart stainless steel cookware set and love it too! I’ve only had it for 3.5 years now, but we get so much us out of it and it still is in perfect shape. It’s a great set! I hesitated to make the investment at first, but it was definitely worth every penny because I’m sure I’ll have it forever. Good list, of course I have way to many gadgets as I get caught up in all the colorful ones. I do use my immersion blender a lot especially when making homemade soups and I need to puree. Yes, I LOVE my immersion blender, too. I almost included it in the list, but I figured it wasn’t exactly essential since you can use a regular blended if needed. It’s essential if you love making soup, though.